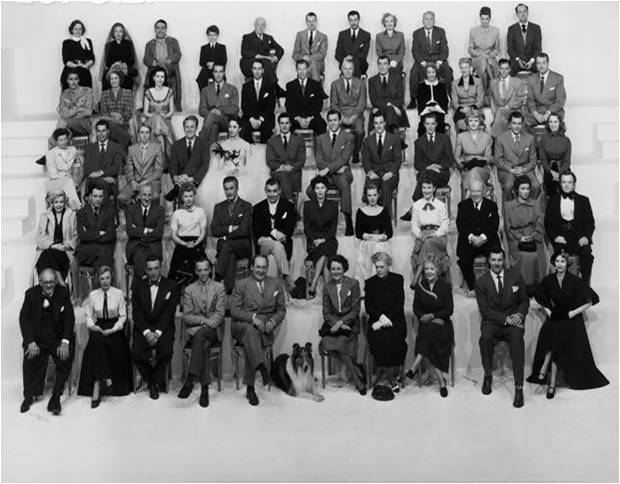 Fabulous shot of the MGM star roster, with Katharine Hepburn and Greer Garson sitting on either side of Louis B. Mayer. (Trust Kate to be in casual trousers). Hedy Lamarr is looking very glamorous as she lounges back in her chair. Celebrating 25 years of MGM in 1949, I can identify most of the players, though some are still a mystery. 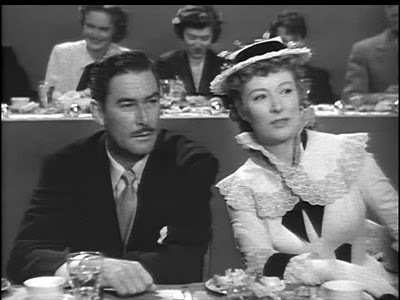 I’m not sure who the lady to the left of John Hodiak, (second top row).And the lady,second top row,far left – wearing a fur stole over her shoulder. Walter Pidgeon looks as though he’s dressed for That Forsyte Woman. I love Fay Bainter’s headgear, and Marjorie Main’s rose. Dame May Whitty and Lewis Stone seem to be looking at another camera. The two redheads stand out- Lucille Ball and Greer Garson. The positioning of the performers show the bigger stars in front few rows and the supporting players to the back. I know it’s possible to find the list of perfomers online, but it’s fun trying to figure it out yourself . This second photo from the same time doesn’t look nearly as good in B&W, but has a slightly different line-up . In this picture, the stars are sitting alphabetically,except for Lionel Barrymore who may have needed that front row spot due to infirmity. Flynn and Gable don’t look too friendly. Katharine Hepburn and Jennifer Jones seem to be looking at two other photographers. Tracy looks bored. Judy’s in this one.And Jeanette MacDonald (coming to the end of her MGM career). And instead of Mr Mayer, Lassie takes centre stage! 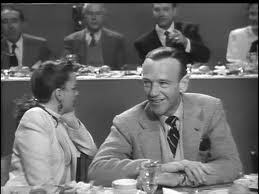 The stars had to sit through a dinner also, while the cameras kept turning.All the stars were introduced to the cameras by George Murphy. 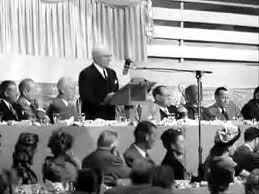 There is footage of the dinner on Youttube.but with no sound except for Mr Mayer’s speech. I’m not sure many of the stars were enjoying their meal, with the cameras whirring away. 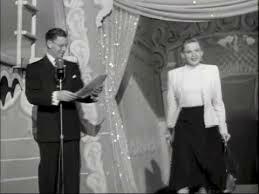 Sitting mostly alphabetically,with some exceptions – Fred Astaire is between Judy Garland and Betty Garrett. I wish the other studios had done something similar. 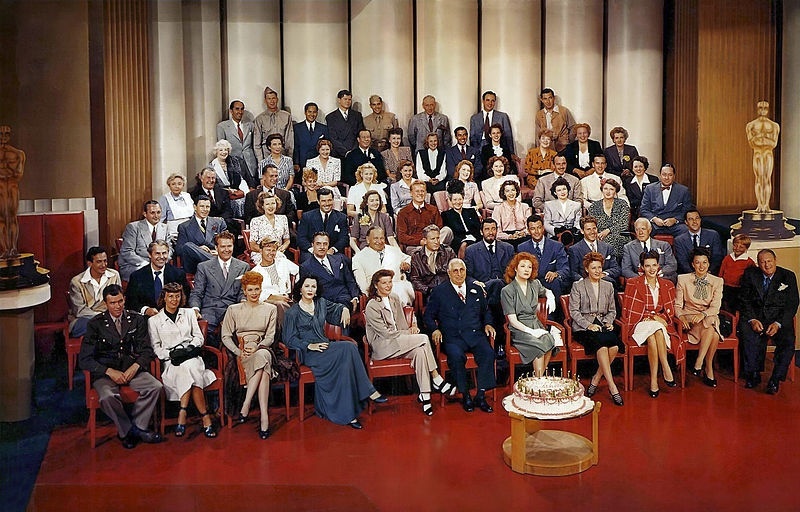 Jimmy Stewart, at the end of the first row, left, in the color pic doesn’t look too happy to be there! Enjoyed this picture. Yes,he’s not smiling. I wondered about his uniform. Maybe Air Force Reserve duty? Can’t think of any his movies at the time with that uniform. I always liked that first color shot. I remember seeing it reproduced in a book that I have/had – can’t remember the title now. Maybe Shipman’s history of cinema volume? However, that title currently resides in my parents’ house the other end of Europe so I can’t check it right now. I first saw the color photo in Hollywood Studio Magazine many years ago. I remember that colour photograph as a double-page spread appearing in a film magazine/broadsheet (must have been the 1980’s, I reckon|), ‘cos I had it framed for ages! So many stars. MGM was certainly at the top of its game at that time. If only it could have lasted!. Hi, Alistair. It was a double page spread in Hollywood Studio Magazine in the 80s. Louis B. only had another couple of years in charge after that photo was taken. “Flynn and Gable don’t look to friendly” Not sure if this meant that they were a bit sour-faced at the time of the photo or that it appeared they didn’t like each other. Actually, they got on with each other very well. Sorry. That was just a quick remark from me looking at the photo. Errol looks in character for That Foryste Woman. I’m glad to hear Flynn and Gable got on well. Two of Hollywood’s greatest.